Lilith is thought be the demon of waste places who originally lived in the garden of the Sumerian goddess, Innana, queen of heaven. She is mentioned briefly in the Sumerian story Gilgamesh and the Huluppu-Tree” (2000 BCE) although it is now being questioned whether the name actually translates as “Lilith”. Persian Incantation Bowls were found with reference to Lilith. The incantation below is an exorcism against her. Other bowls refer to her divorce. There is only one verse in the Hebrew Bible, Isaiah 34:14, that may be a reference to Lilith. A passage in the Songs of the Sage (4Q510-11) of the Dead Sea Scrolls also mentions Liith in a context similar to Isaiah 34. – from Geza Vermes’ translation, in Martinez’s translation “Lilith” is pluralized. Rabbi Isaac ben Jacob ha-Kohen wrote in the second half of the 13th century in Spain. His treatise on evil was entitled “A Treatise on the Left Emanation”. This work introduces Samael and Lilith as husband and wife, a concept which was then incorporated into later Kabbalistic demonology. Rabbi Isaac then explains that when Adam and Eve sinned in the Garden, it caused two sexual awakening among the two pairs of “twins”. This was the awakening in which the snake, either called Nahasiel or Gamliel, took part – the event that caused evil to become its own entity capable of expression. The question is then how did Samael and Lilith become paired together? Samael was an archangel of Rome and originally one of the fallen angels in the Book of Enoch. Lilith, on the other hand, was an ancient Near Eastern deity, who was mentioned in Isaiah 34:14, and is known as a danger to infants. 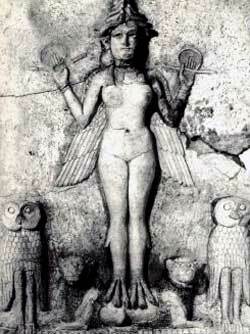 The Alpha Betha of Ben Sira (Pseudo-Ben Sira) states that Lilith was Adam’s first wife before Eve. Eli Yassif studied this text in detail and concluded that two versions existed: one similar to the original and one that was edited and enlarged by a later compiler. Examining the differences between the two versions helps to explain how Lilith may have become Samael’s spouse. They tried to take her back, but she refused. They asked her: ‘Why don’t you want to go back? She told them: “I know that I was created for the sole purpose of making babies ill from their day of birth until the eighth day, when I have permission, and after eight days I have no permission. And if it is a female, [this is so] for twelve days!’ They said to her” ‘If you do not come back we shall drown you in the sea.’ She answered: ‘I cannot return because of what is said in the Torah – ‘Her former husband who sent her away, may not take her again to be his wife, after that she is defiled, that is, when he was the last to sleep with her. And the Great Demon has already slept with me. Samael very quickly came to be the “Great Demon” of this version – the “ha-Shed ha-Gadol” who defiled Lilith so she could not return to Adam. Another text, dating from the 13th century, the Treatise on the Left Emanation, speaks of multiple Liliths, one as the consort of Sammael and the other is the consort of Asmodeus. This is the exact text of what is written in The Chapters of the Lesser Palaces as we have received it, word for word and letter for letter. And the scholars of this wisdom possess a very profound tradition from the ancients. They found it stated in those Chapters that Samael, the great prince of them all, grew exceedingly jealous of Asmodeus the king of the demons because of this Lilith who is called Lilith the Maiden (the young). She is in the form of a beautiful woman from her head to her waist. But from the waist down she is burning fire–like mother like daughter. She is called Mehetabel daughter of Matred, and the meaning is something immersed (mabu tabal). The meaning here is that her intentions are never for the good. She only seeks to incite wars and various demons of war and the war between Daughter Lilith and Matron Lilith. They say that from Asmodeus and his mate Lilith a great prince was born in heaven. He is the ruler of eighty thousand destructive demons and is called “the sword of king Asmodeus.” His name is Alefpene’ash and His face burns like a raging fire (‘esh). He is also called Gurigur, for he antagonizes and struggles with the prince of Judah, who is called Gur Aryeh Yehudah (Lion-cub of Judah). From the same form that gave birth to this war-demon another prince, a prince whose root is in Kingdom, was born in heaven. He is called “the sword of the Messiah.” He too has two names: Meshihi’el and Kokhvi’el. When the time comes and when God wishes, this sword will leave its sheath and verses of prophecy will come True: “For My sword shall be drunk in the heavens; Lo, it shall come down upon Edom” (Isaiah 34:5). “A star rises from Jacob” (Numbers; 24:17). Amen. Soon in our days may we merit to see the face of the Messiah our righteous one; we and all our people….